The bestselling music guide - now updated and with a FREE DVD! Have you always wanted to learn to play guitar? Who wouldn't? Think of Jimi Hendrix wailing away on his Stratocaster. . . Chuck Berry duck-walking across the stage to "Johnny B. Goode". . .B.B. King making his "Lucille" cry the blues. No doubt about it—guitars are cool. 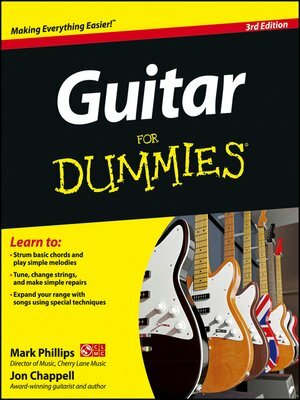 Guitar For Dummies gives you everything a beginning or intermediate guitarist needs: from buying a guitar to tuning it, playing it, and caring for it, this book has it all—and you don't even need to know how to read music. Full of photo-illustrated exercises and songs you can play to practice the techniques discussed in each section, this step-by-step guitar guide will take you through the basics and beyond before you can say "Eric Clapton." Fully revised and updated, with an all-new interactive DVD packed with video and audio clips that help you learn, tune, and play along, Guitar For Dummies is the perfect introductory guide for any novice acoustic or electric guitar player.